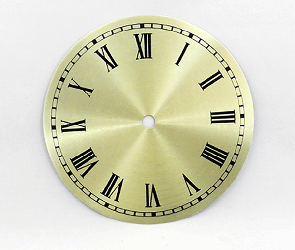 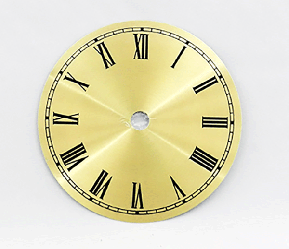 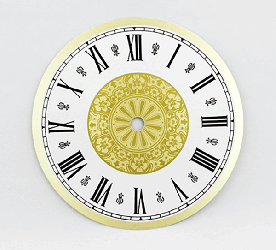 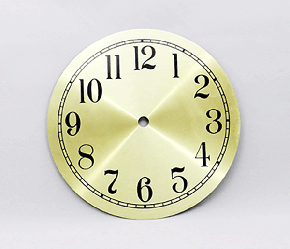 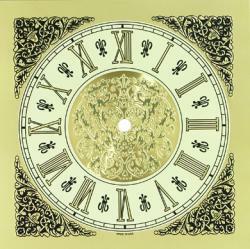 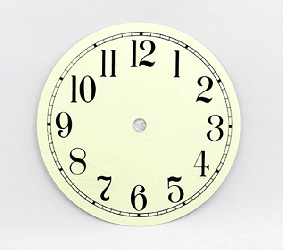 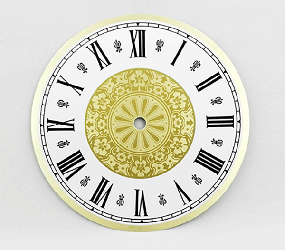 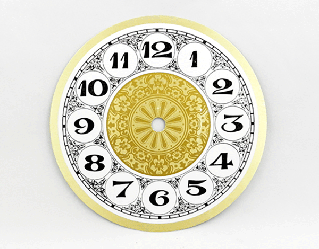 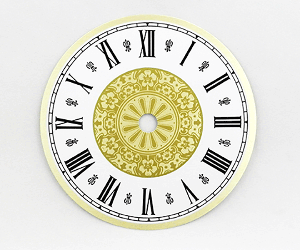 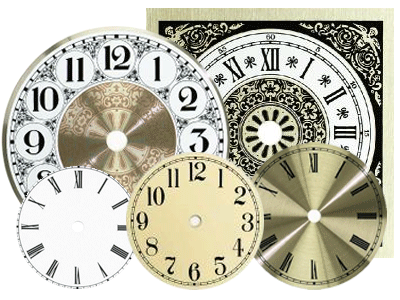 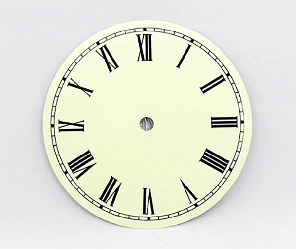 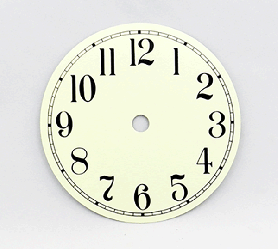 Round and Square Clock Dials - 4" to 8"
Buy Clock Dials (Faces) at Incredible Prices - Check out this great selection! 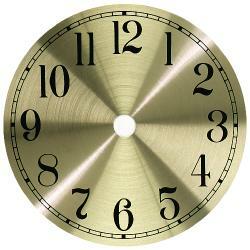 Scroll below to select from premium and economy clock dials - they are arranged from smallest to largest. 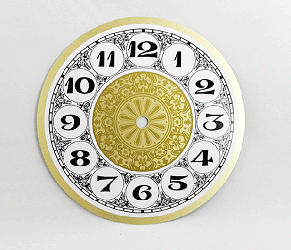 Need a custom clock dial? 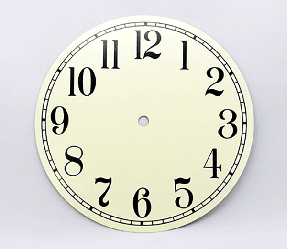 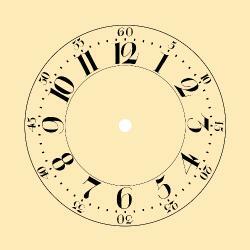 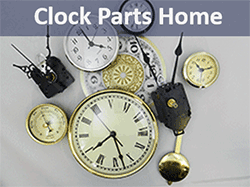 For orders of 100 pieces or more at a time, we can make custom clock dials. 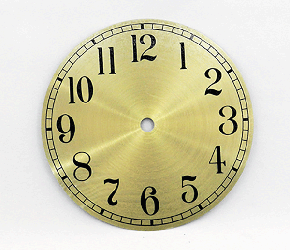 Round Metal Clock Dials. 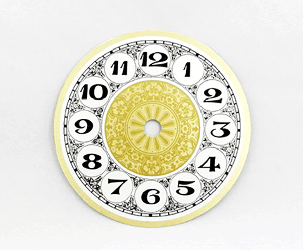 Made of spun aluminum each dial is less than 1/16" thick. 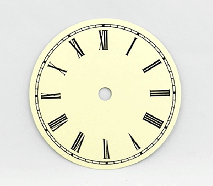 Printed with epoxy based inks then baked to produce a long lasting finish. 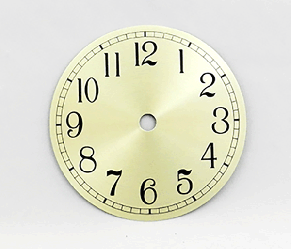 All of our metal clock dials have a protective plastic coating. 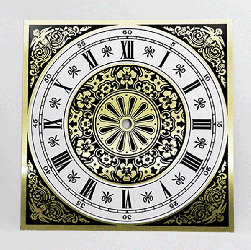 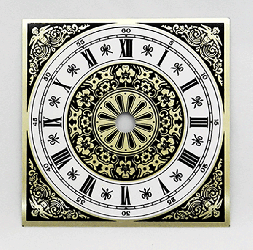 Square Metal Clock dials that are embossed have raised corners, centers and numbers. 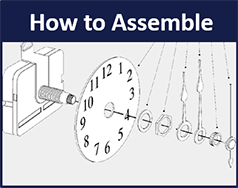 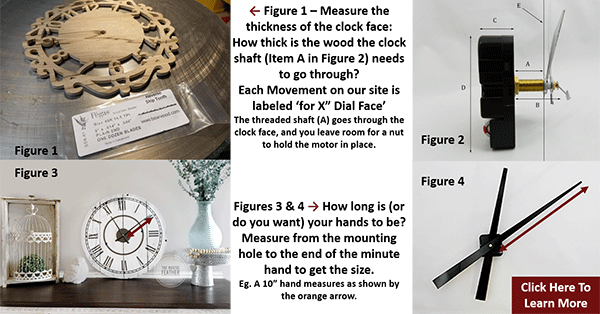 Pro Clock Making Tip: When choosing hands, the length of the minute hand should be about the same or just slightly less than half of the time ring diameter. 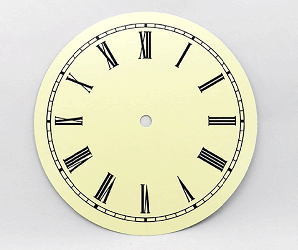 Please remember to remove the protective plastic coating from the faces before using. 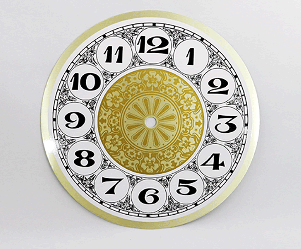 Ivory Arabic Metal Dial 7"
Fancy Arabic Metal Dial 6"
Gold Arabic Metal Clock Dials 4-1/2"
Fancy Square Roman Metal Dial 4"
Ivory Roman Metal Dial 4-1/2"
Ivory Arabic Metal Dial 4-1/2"
Gold Roman Metal Clock Dials 4-1/2"
Clock Dials Gold Arabic Metal 4-1/2"
Fancy Roman Metal Dial 6"
Gold Arabic Metal Clock Dials 6"
Ivory Arabic Metal Dial 6"
Gold Roman Metal Dial 6"
Ivory Roman Metal Dial 6"
Gold Arabic Metal Dial 7"
Fancy Roman Metal Dial 7"
Fancy Arabic Metal Dial 7"
Ivory Roman Metal Dial 7"
Ivory Arabic Metal Dial 7-7/8"
Fancy Arabic Metal Dial 8"
Fancy Roman Metal Dial 8"
Fancy Square Roman Metal Dial 8"
Gold Arabic Metal Dial 8"